When all the things we saw on the runway is affordable. Nice. Moisturizer is NOT your one and only beauty savior. Read on. When your skin or the climate is acting up on us, making our skin drier than usual, reach out for these products. Yes we still have to exfoliate to get rid of those dead skin cells on the surface. Face mask is the essential product to keep our skin plump and well-hydrated. It’s just not another layer, OK? Facial serum can give us added moisture into deeper layers of our skin, which moisturizer can’t do. That’s why it costs more too. Dry skin is one thing, but dehydrated skin is another problem. Without any hydration help, our skin would be flaky, itchy and feel tight. While we were sleeping, our beloved skin is regenerating. A potent night serum will work its’ charm and magically transform dry skin to moist skin over night. First Oscar and first ad campaign as the face of Miss Dior. Not bad for a 22 years old actress, right? While the ads will be shown worldwide in prints by April 2013, thanks to Dior Indonesia, I got to share these stunning pictures of her. Shown with Miss Dior bags, she wears designs from Spring RTW collection by none other than Raf Simons, current Dior Creative Director. Thanks to the technology, Audrey Hepburn and the glamour of the 1950’s is back …..
in the new advertising campaign for a chocolate brand, that is. Yes, the iconic screen and style icon is brought back to life using what reportedly as a never before seen footage of Audrey Hepburn. 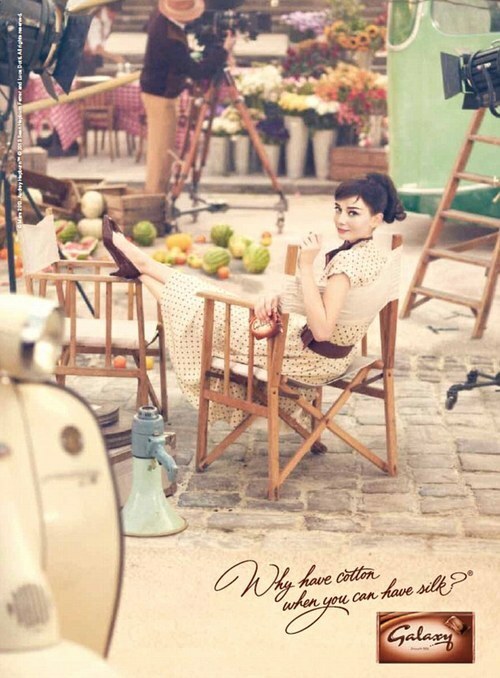 The ad which took more than a year to make, was set in the 1950’s on a beautiful Amalfi Coast, Italy. This new advertising campaign just launched in UK on February 24. Yes, beauty is pain. The once tidy and short bangs will eventually grow and itch and split. But wait, before you cut it and repeatedly going through the same bangs experience again, it’s saver to keep it growing..at least for now. Still spotted at the Fall Winter 2013 runways, overgrown bangs are apparently still ‘in’. Seen here at Emilio Pucci and Anna Sui, and on the red carpets like Kerry Washington and Diana Agron. The ‘almost poked your eyeballs’ style need a serious makeup. You see, bangs draw the focus to your eyes. Clip your bangs while doing your makeup and let’s start. 1 Rimmed them nicely. While eye shadows might not show too much, cause your bangs are covering your upper lids, you need more eyeliner. Pronto! Black, blue, violet, go beyond your wildest color possible. 2 Skip your eyebrows makeup. Don’t even bother to filling in the sparse. Clear eyebrows gel will do to tidy up. That’s why always, always groomed your eyebrows professionally. 3 Doubled or tripled your mascara usage. Long, curly and full lashes are important key to make your eyes pop, even though they’re almost half covered. 4 Put extra shine stopping powder on your forehead, please. Because split bangs on the forehead look childish and untidy. And the caused of that split bangs is…(you guessed it) shiny, oily and sweaty forehead. So keep the forehead matte. 5 Never neglect your lips. Keep it lined properly, and fill them in with a nice matte or glossy lipsticks. No need to go strong if you wish. Keep it neutral, but lipstick is a must. 6 Use highlighter on upper cheekbones. It will bring out your best feature even though your forehead is being covered. The traditional print is back for Fall Winter 2013. Anna Molinari for Blugirl mixed tartan with bold leopard prints. Definitely not a school girl look, the collection was inspired by style icon Alexa Chung. Meanwhile at Moschino, equestrian styling is the key to rock the tartan look. NO TIME TO PUT ON BODY LOTION? Here’s to our beauty savior. In this wonderful world of beauty, you really have to try anything and I mean it. That’s precisely why this blog existed in the first place. The key words will be: you won’t know until you try. Exactly my thought when I tried L’Occitane Amande Shower Oil. – Smells heavenly. I wish L’Occitane will make the same fragrance of this scent. – Looks like oil, feels like oil, but not oily. Get it? It’s weird, hard to explain until you try it yourself. – Cleanse my body like never before. It’s not foamy, yet my skin feels so clean. – Makes my razor glides evenly. Use this oil as a base for shaving on dry skin before taking a bath, and feel how smooth the result is. – Leaves sort of satiny feeling after I towel dry. – Cuts my morning rush time. I’ve tried using body lotion afterwards, it won’t absorb like usual. This shower oil made me realize, ‘hey, I probably don’t need body lotion anymore’. Tight budget? This is the fashionable way out without THE price. Not proud of becoming a citizen of the number 4 most populated country in the world, but if it means top fashion retailers are aiming to open here in Jakarta, then I’m good. One of those fashion retailers is Uniqlo, brought to us by Fast Retailing Co, a global retailer company from Japan. Personally, I like their Designers Invitation Project when Uniqlo collaborated with top designers around the world. I had Paul & Joe, Vena Cava, Orla Kiely and their latest Lulu Guinness. I found Uniqlo as one of my favorite casual fashion brand, as they’re very affordable and super comfortable. And I practically collected their HeatTech collection, which are perfect for layering, especially if I have to travel to countries with winter season. A day before Valentine’s day, last week, Uniqlo celebrated Fashion’s Night Out, when they announced their plan to open their first store by mid of 2013. Reportedly will be one of the biggest store in South East Asia, their first store will be located at Lotte Avenue Shopping Store, Kuningan, Jakarta, Indonesia. With a store that huge, they promised to bring in their complete collection, for men, women, kids and baby. At the event, they also announced their brand ambassadors, Indonesia’s very own young musicians, Vierratale, the beautiful actress, Shireen Sungkar and footballer, Bambang Pamungkas. Celebrated in Prive, FX, Jakarta, there were fashion shows from Uniqlo SS 2013 Collection and the most fun part for fellow medias: Free Clothes. Yes, Uniqlo was giving away free Uniqlo clothes for all guests that night. Excited? You bet. Mr. Yasuhiro Hayashi, Chief Operating Officer of PT Fast Retailing Indonesia said there’ll be more Uniqlo’s fashion events before the opening of their first store. Wow, more fashion parties. I’ll keep you updated. How do your eyebrow look? Back in July last year, I’ve tried Anastasia Beverly Hills in Bangkok. See my previous post here. The latest eyebrow shaping adventure I had, was at Erabelle Prestige, Singapore. Located in Vivo City, I decided to go with one of their services, named Erabrow Design. The brow trimming service, non permanent ones. I don’t have the courage yet to do any semi-permanent either permanent eyebrow shaping, so from now, it seems to be a safe choice. The 20 minutes service (that was quick) of eyebrow shaping cost me SG$29. They plucked, trimmed, and colored (with eyebrow pencil) my eyebrows to my desired shape which also suit my face shape at that moment (which apparently turned heart shaped when I got too thin). Service’s wise, OK. Love the ambience and the nice therapist with kimonos, but I still prefer the end result from Anastasia Beverly Hills. Every great thing does come with the price, indeed.